While I’m not one to typically commit to watching a TV show consistently, I am certainly one to get addicted (read: binge watch) to a series for a certain number of episodes or seasons before completely losing interest. Early last week I came across a Korean drama called “Doctor Crush” (also known more simply as “Doctors”) and well, quite honestly, I couldn’t tell you what I accomplished that week- I’m such a sucker for medial dramas. I mean seriously, you give me a good medical drama- one with some surgical action and awkward romance attempts and complicated unrequited love triangles and I’m totally hooked. Most of the non-essential tasks (“essential”, being a loose statement) were completely forgotten and pushed aside. I think I only truly accomplished going to the gym once and I managed to shower a few times and occasionally scrounge around for food like toast. Since I only know a single word of Korean, I couldn’t even manage any multi- tasking whatsoever. I am thankfully able to report however that towards the end of last week I was able to finish the show (at least up to the most recent episode), break out of my stupor, begin life again and wonder why on earth I wasted so much of my week. This week I’ve already gotten off to a good start (partially to make up for last week’s failures). I’ve begun to concisely organize posts on various social media platforms (if you follow me on twitter, you may have noticed my posting game has been on fire! ), I also finally decided enough was enough with my pottery (my mom and I have gotten really into wheel pottery and our work now covers many surfaces within the house) and made an Etsy account with the hopes of slowly downsizing my work. I finally put together an Amazon seller account to try and get rid of that pile of college textbooks from previously taken classes. I also spent half the day on Monday hunting for inexpensive places to purchase boxes and shipping equipment. The answer ended up being one of my least favorite places: Walmart. Who knew? 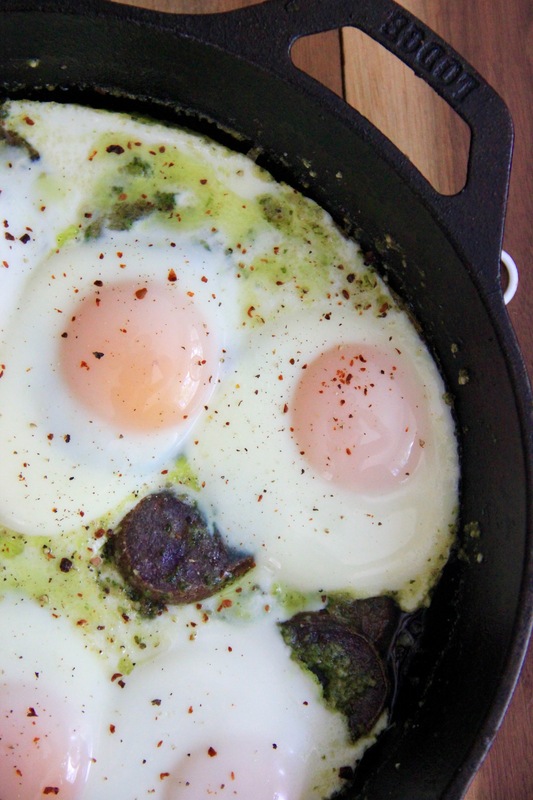 Anyway, this recipe I’m sharing today is one I made no less than three times for breakfast last week. It was simple and hands-off enough (really just the occasional pushing around of potatoes) that it was one of the few things I could actually multi-task while watching Doctor Crush. 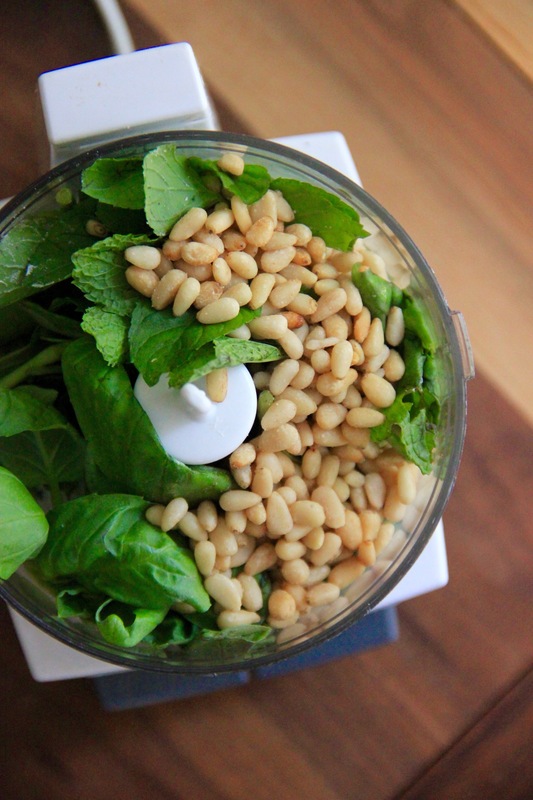 While store-bought pesto works perfectly fine, I decided to alter the pesto recipe a bit to use up some of that “rogue mint” I keep talking about. 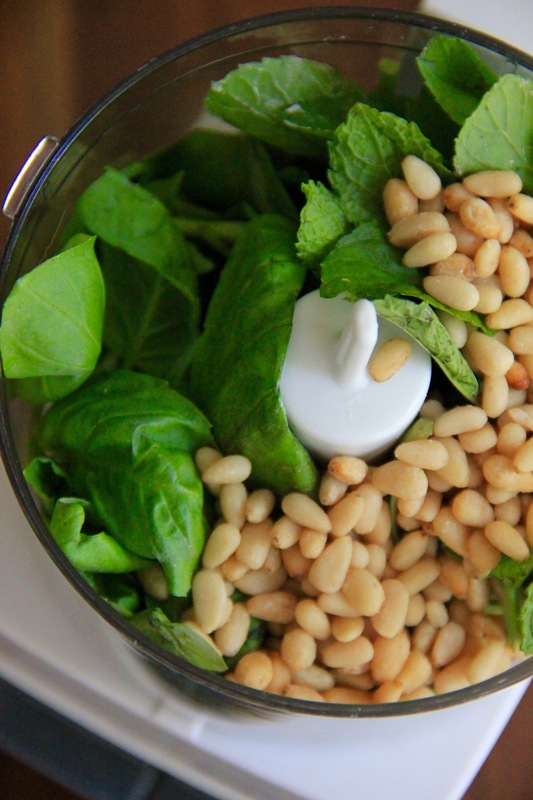 Combine the basil and mint in a food processor and process until finely chopped. Add in the parmesan cheese, pine nuts and salt and process again. Add in the olive oil and process until it’s reached a smooth consistency. Cover and set aside. This can be made in advance, if you aren’t using it immediately, store it covered within the fridge until ready to use. Slice up the potatoes in 1/4 inch rounds. 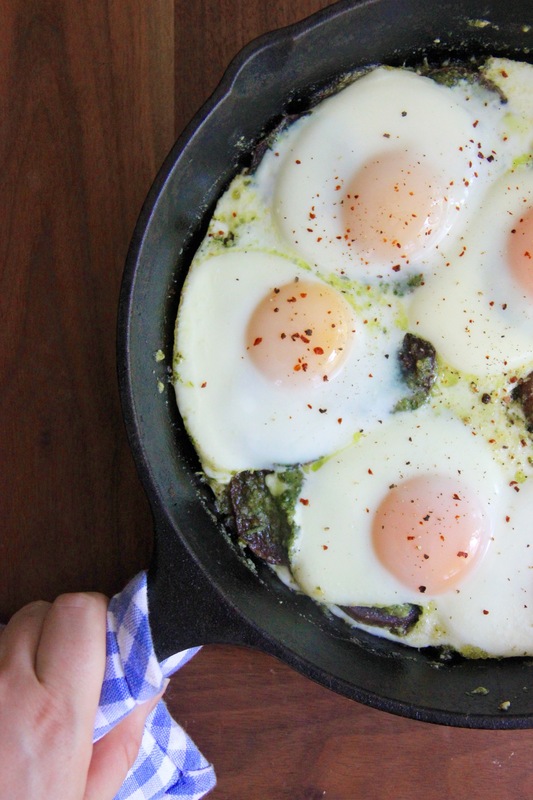 In a mediums-sized, oven-ready skillet, add the butter or lard. Heat over medium heat until melted. Add the potatoes and toss to coat. Cook for about 10 minutes, pushing around the potatoes and flipping them as needed. About 5 minutes in, preheat the oven to 350° F.
Once the have started to soften, turn off the heat and add the pesto. Toss to coat. 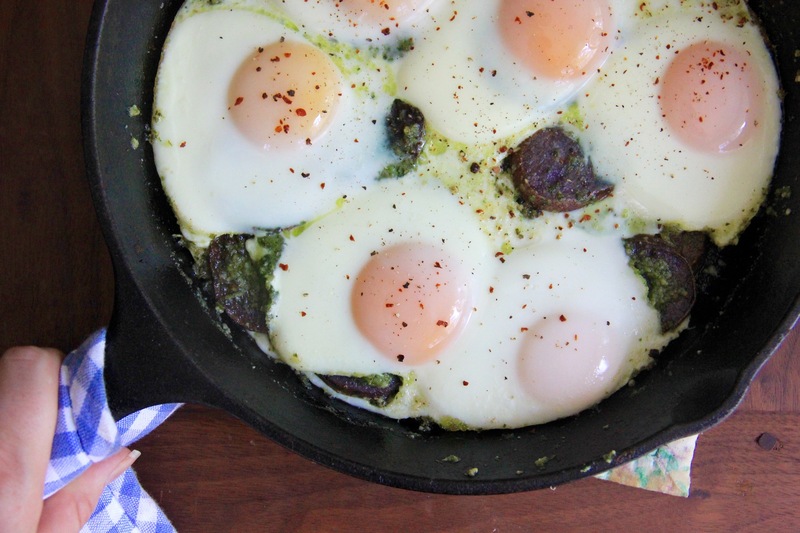 Once the oven is up to temperature, carefully crack the eggs into the skillet and add it to the oven. Cook for about 10 minutes in the oven or until the egg whites are set. Remove from the oven and sprinkle with red pepper flakes and pepper.